This giveaway is now over. The winners are Elaine R and Kim Benton! Congrats! Catstudio is a unique company. Its mission is to take consumers around the world with their hand-embroidered products. They have everything from pillows to glasses to aprons to dishtowels. All of the products are hand-embroidered and feature a whimsical look at your favorite places, including, state, regions, cities and even countries. I was able to try out both the frosted glassware and the dishtowels. First, my husband was more than excited when he saw the frosted glassware. These glasses are a sight to see! The detail work on these are amazing. The glasses are so well done that you are afraid to use them! All of the frosted glassware feature fun highlights of your favorite state/region. The tumblers are 15 ounces each and feature seven colors and matte gold on each one! 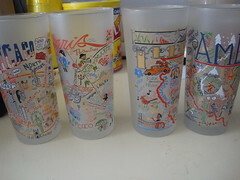 You can easily pick and choose your favorite “place” to drink from! The price on these? $12/glass or $48 for a set of four! Best of all? These are dishwasher safe! The dishtowels are just as amazing as the glassware. Each dish towel design is silk screened then framed with a hand embroidered border on a 100 percent cotton dish towel. Three stripes down both sides and hand dyed ric-rac top and bottom add a charming touch. You are able to dry your dishes with your favorite region, country, state or even park! They retail for $20 and can be machine washed. Check out the Catstudio site and tell me what you put on your glassware? Your state? Your city? Your Region? Or something else? 4. Add blm03 to any of your Twitter lists. Good luck! This contest will end May 4th, 2010 at 12:00 PM CST. The best way to refrigerate leftover raw onions is to place them in a screw top glass jar. They can be refrigerated this way up to 1 week.